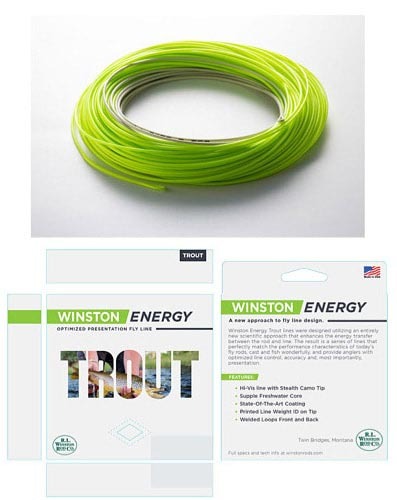 STEALTH / HIGH FLOTATION TIP – Winston ENERGY Trout fly lines are all two colors and feature a muted-color, low visibility high flotation stealth tip section of 10-feet to help avoid spooking fish when the line is in the air or on the water. Winston ENERGY Trout fly lines also feature high flotation tips for a better read and reference for the angler. LINE COLOR – Winston ENERGY fly line colors were chosen to look beautiful as well as for optimum performance. The muted putty-color 10-foot front tip section on the ENERGY Trout lines helps to avoid spooking fish when the line is in the air and on the water. For the fly line ‘belly’ and ‘running line,’ our bright Chartreuse Green color was chosen specifically to help anglers better see their line in the air and on the water which can help with casting performance and mending. LINE WEIGHT MARKING – All Winston ENERGY fly lines come with the line weight and fly line model marked clearly but subtly toward the front of the fly line to make sure the angler always knows which line is on the reel. LINE COATING – Winston ENERGY lines use a state-of-the-art durable coating to enhance surface slickness. Especially when used together with the new Shooting Guides™ on Winston fly rods, these fly lines significantly reduce friction, resulting in incredible accuracy and optimal presentation of the fly line and fly. LOOPS – All Winston ENERGY fly lines have durable welded front and back loops making it easy for the angler to quickly change leaders or to change out the entire fly line. For those who prefer not to use loops, they can be snipped off quickly and easily without affecting the fly line performance.